NPS stands for Net Promoter Score. It's the hot new metric that seems to be taking the startup world by storm. But...what is it? And how do you collect it? And more importantly - why should you care? 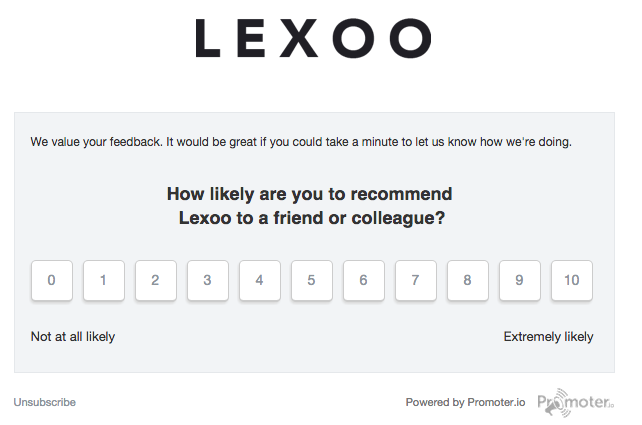 At Lexoo we've been gathering NPS results on a weekly basis for the last six months and have learned a thing or two about this useful metric. The customers answer this question on a scale from 0 (no way) to 10 (absolutely)! If they respond 9-10 they are considered promoters - these are your customers who would 'actually' recommend your business to friends and colleagues. Respondents that give you a 0-6 are detractors - these customers are more likely to tell their friends and colleagues negative things about your business. Everyone else (7-8) are called passives. They are no more likely to promote or detract. To calculate your NPS you take the percentage of customers who are promoters, and subtract the percentage of those who are detractors. 25 give you a 7 or 8. NPS = (40 - 35 = 5) giving you a 5 NPS. It's important to point out that this is NOT a percentage. If you tell people your NPS is 35% then they will think you don't know what you're talking about. A positive NPS (>0) is a good thing - and an NPS greater than 50 is considered excellent. Gathering NPS is a great way of understanding customer satisfaction. Do your customers actually like your business enough that they'll recommend it to a friend? If not, why not? Also - one bonus side effect of gathering NPS is getting to know the customers who are going to spread the good word about your business. When you've identified them, you can reward them for referring to their friend or colleague with some kind of loyalty scheme or referral program. 1) If a customer tries out Lexoo and then decides not to go ahead. There's no use capturing an NPS of only happy customers, we want to see what ALL the customers think. We wanted to ask them at this point because we want to know how they like 'Lexoo' before they've had a chance to try out their lawyer. 3) After the legal work has been done by the lawyer. This is useful to see if the NPS score changes after they've used their lawyer. We felt the best way of asking the NPS in the first two instances is with an email. There are numerous services out there that can handle your NPS surveys through emails, and they have their own benefits and drawbacks. We eventually decided to go with promoter.io because, well frankly, their emails looked the nicest! Something that promoter.io does which is great is follow up the NPS survey with a follow up question: "Why did you decide to give us this result?". This has proved to be the absolute best part of gathering NPS results. We get immediate feedback about all sorts of areas of the product. At Lexoo we have a script that grabs the email addresses of all the customers that week who have decided to not use Lexoo, and those customers who we've introduced to lawyers. A process then uses the promoter.io API to upload these email addresses to a contact list for sending out every Tuesday morning. Promoter.io can be setup so that when a client writes a detailed response to the survey, the responses are forwarded to an email address. We've set it up so that the responses get forwarded to the whole team, so everyone's aware of how our customers are feeling. It's a great way for the whole team to have a customer focus (and also if there's any good news it's a great boost to the team!). And because your customers can be your best advocates, their words can make for excellent copy on Twitter and social media. I then use the promoter.io interface to personally respond to everyone who has answered the survey. For the respondents who give us a 9 or 10, I offer to sign them up to our refer a friend program to help nurture a continual growth loop. To everyone else, I ask them what they think we could've done better. This has led to some really useful feedback - not just about the product, but about our full customer experience. After the lawyer has completed the work then we invite the customer to review the lawyer through the site. As part of this process we ask them the NPS question again. The idea behind this is to see how the NPS has changed after the legal work is 'actually' done so we have a clear understanding of the end-to-end Lexoo experience. I hope this sheds a little light on NPS. If you have any questions just hit me up in the comments. I’d also love to learn more and hear your experiences using NPS so feel free to get in touch.